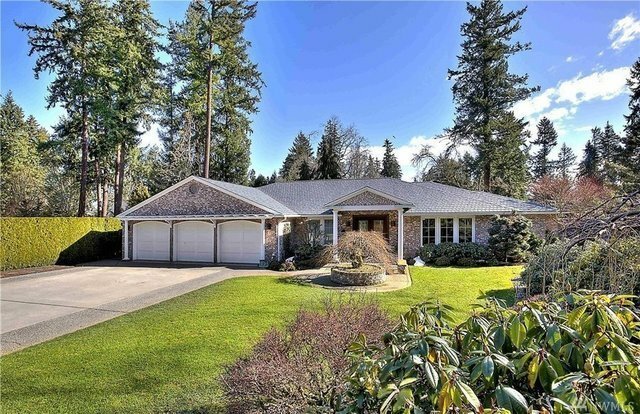 Custom built brick rambler on .51 acres located in the Tacoma Country and Golf Club. Open concept living room with gas fireplace, wall of windows and two sliders that lead out to the covered patio.Chef's kitchen with high-end appliances, Corian counters, tile backsplash, island with bar seating, built-in desk and pantry cabinet with custom pull-outs. Formal dining room with tray ceiling, crown molding, wainscoting and decorative pillars. Home theater and office/den.Master suite in private wing away from other bedrooms with custom closet and 5-piece bath.